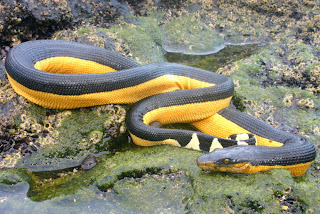 This overdue post was inspired by the symposium ‘‘New Frontiers from Marine Snakes to Marine Ecosystems’’ presented at the annual meeting of the Society for Integrative and Comparative Biology, January 3–7, 2012 at Charleston, South Carolina, and featured in a special issue of the journal of the same name. I've written before about some of the amazing aspects of sea snake biology. 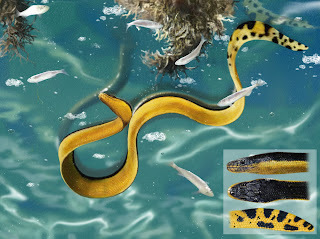 From the morphological and physiological to the behavioral and reproductive, few sea snake adaptations cease to amaze. But one topic I had never before considered was marine snake parasitology. 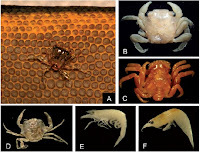 I knew that the skin of whales, the shells of sea turtles, the hulls of ships, and other mobile pelagic surfaces often serve as a substrate for smaller, more sessile marine organisms, such as barnacles, collectively known as epibionts. In fact, I recently learned that the total weight of all the barnacles on a single Gray Whale can exceed seven hundred pounds and that these barnacles serve as homes for other, more parasitic hitchhikers such as whale lice. But I had never heard of marine reptiles other than sea turtles harboring parasites. I was surprised to learn that many marine snakes play host to epibionts. Twenty-eight of the ~65 species of sea snake have been documented to harbor at least one kind of epibiont. 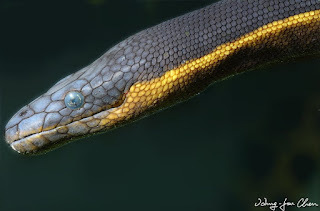 But one species, the Pelagic or Yellow-bellied Sea Snake (Pelamis platurus [sometimes platura]), harbors more kinds of epibionts than any other. In order to understand why, it is helpful to know that Pelamis platurus is found farther out in the open ocean than any other kind of sea snake. Most species of sea snake stick relatively close to reefs and shores in the Indian and Pacific Oceans, but Pelagic Sea Snakes are found from the east coast of Africa across the tropics to the west coast of the Americas. They are the only exclusively pelagic marine snake, meaning they live near the surface of the ocean but far away from land, and their distribution spans more than half of the Earth's circumference, making them the most widely distributed snake on Earth. Artist's rendition of "float-and-wait" foraging. I was unable to find a photograph of this behavior. Although there is some debate about the amount of intent used to get there, Pelagic Sea Snakes sometimes congregate around calm areas where ocean currents converge, ("slicks"), where flotsam, debris, and pelagic organisms are often concentrated. By one 1519 explorer's account, Pelagic Sea Snakes were "innumerable" along one such slick on the west coast of Costa Rica. Pelagic Sea Snakes are "float-and-wait" predators, meaning that they passively drift in the water waiting for fishes to come near. A similar strategy is used by many terrestrial snakes, such as vipers and large pythons, except that in the open ocean, many fishes probably approach purposefully, meaning to take shelter beneath the seemingly inanimate snakes. The snakes then strike sideways or by swimming rapidly backwards. Their venom, like that of most sea snakes, is made up of only one or two exceptionally potent compounds, unlike the complex venoms of most terrestrial snakes. Partially as a result of their biodiverse habitat and immobile foraging behavior, Pelagic Sea Snakes play host to a diversity and abundance of epibionts almost twice as great as that of any other kind of sea snake. Most marine snake epibionts are invertebrates. Barnacles are ubiquitous, and familiar marine creatures such as crabs, shrimp, snails, and oysters are also found living on sea snakes, alongside more obscure marine animals such as hydrozoans (hydras) and bryozoans ("moss animals"). Polychaete worms and ticks round out the epibiont fauna, and algae, diatoms, and a type of protist called foraminiferans ("forams" for short) represent a sort of flora, although none of these organisms are true plants. Most amazing to me are two chordates, a tunicate and a clingfish, that were recently documented as epibionts of Pelagic Sea Snakes. Tunicates, also known as sea squirts, are marine filter feeders that have a sac-like body structure as adults. Tunicate larvae are free-swimming and resemble tadpoles, but at metamorphosis an adhesive disc on their "head" transforms into a stolon, or "foot", which they use to cling to a rock or, in this case, a sea snake. The pelvic fins of clingfishes are modified into a sucking disc, which they use to hold onto their snake hosts. How they avoid being eaten, I do not think anyone knows yet. and cannot move on land. Most that land on beaches die. Why do so many animals live on Pelagic Sea Snakes? One explanation may be the protection associated with settling upon one of the world's most venomous serpents. Pelagic Sea Snakes are not eaten by most seabirds or fishes (although naïve Atlantic fishes will consume them, and sometimes die from it) and so neither are their epibionts. Perhaps natural selection has favored the crabs, barnacles, and tunicates that live on sea snakes over those that land on more palatable substrates. Furthermore, the complex interplay among various members of the sea snake epibiont community may allow more species to coexist there. 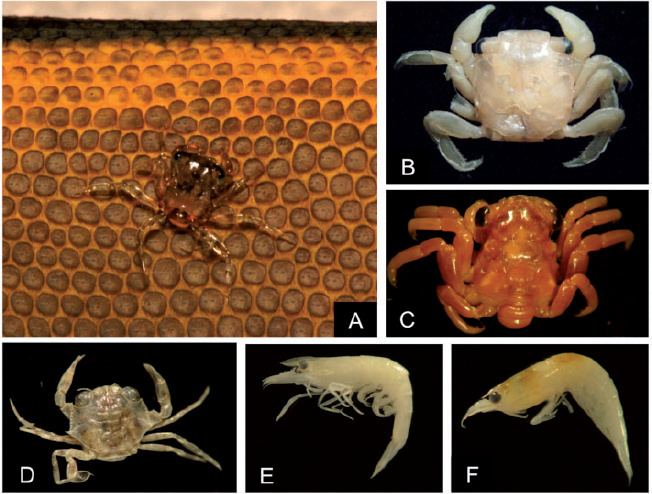 For instance, predatory epibionts such as larval crabs may benefit the sea snakes by controlling populations of other, more detrimental epibionts, such as barnacles, which probably slow or block the update of oxygen by the snake's skin during long dives. Sea snakes are among the most amazing of serpents, and Pelagic Sea Snakes are among the most amazing of sea snakes. From their saffron bellies to their lung, used to control buoyancy, to their roles as substrates for unique ecosystems, these snakes might just be the most incredible snakes out there. Thanks to William Flaxington, Hung-Jou Chen, Chayajit, and Stuart Jackson-Carter for their photos and digital illustrations, and to Joe Pfaller for answering my questions about sea snake epibionts. 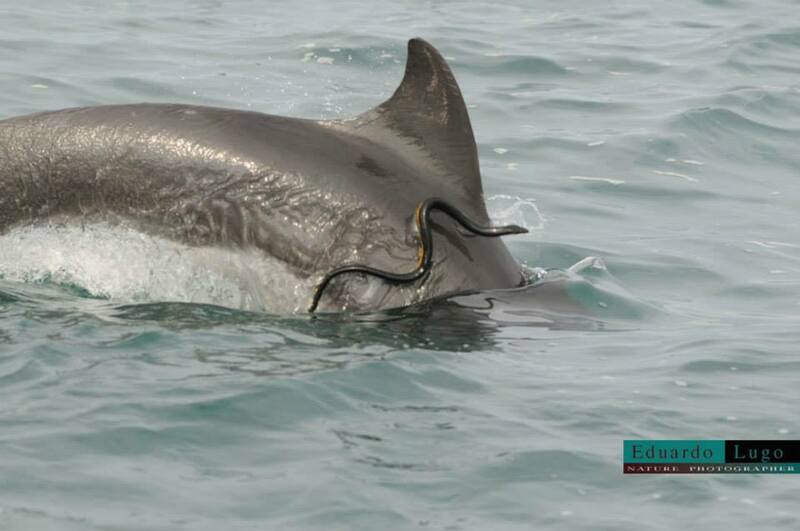 Perhaps Pelamis is heading towards a lifestyle as a dolphin epibiont? Lugo says they were swimming with the dolphins from a Wildlife Connection ecotour boat when the dolphins decided to play with the snake. These large, harmless, common snakes are known for their loud hiss, which they augment using a flap of skin on the end of their windpipe. They also rattle their tail against dry leaves in order to intimidate their would-be predators. Also known as gophersnakes or blowsnakes, they are commonly mistaken for rattlesnakes, which they superficially resemble. 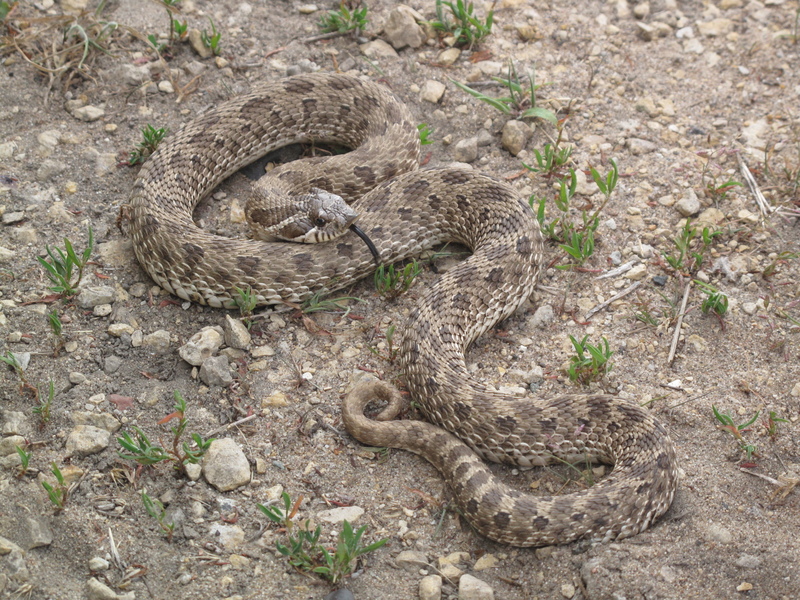 Bullsnakes are found throughout the plains of central and eastern Montana, as well as in the Bitterroot Valley of western Montana. Appropriate to Big Sky Country, bullsnakes are among the longest of North American snakes, reaching incredible lengths of 9 feet as adults! Radiotelemetry studies have found that individuals spend up to 90% of their time in underground burrows, so these snakes must be quite abundant in areas where they are frequently encountered. I studied these snakes in Illinois for my Master's degree, but nowhere have I seen them so abundant as in the Nebraska sandhills. 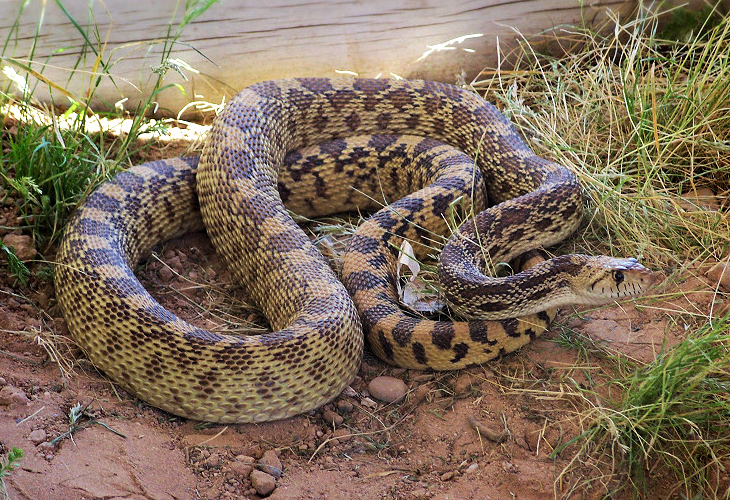 Western Hognoses love sand, in which they burrow and lay their eggs. They also frequently unearth the buried eggs of other species, including those of lizards and turtles. Like their eastern cousins, they also eat amphibians and possess elaborate anti-predator displays. These snakes are easily observed in open areas during the day by anyone willing to hike around the beautiful sandhills region of the Cornhusker State. Known for its nightlife, the Silver State is well-represented by Nightsnakes, which are secretive residents of deserts throughout the west. Nightsnakes are nocturnal, as evidenced by their vertical pupils, and eat lizards and amphibians, as well as lizard and snake eggs on occasion. They are most active on moonless nights after rain. Few people will have seen a Nightsnake, but they occur throughout Nevada. I also heard that the Nevada Nightsnakes might be a competitive team against the Mississippi Mudsnakes this year. 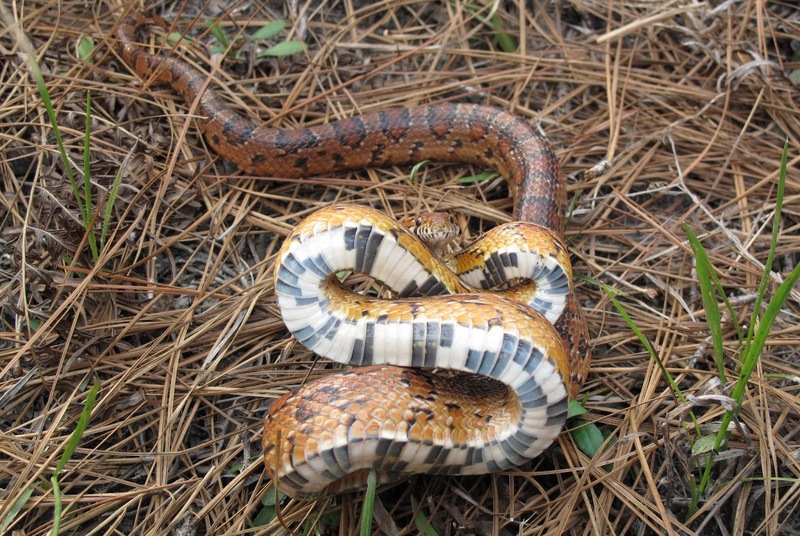 Eastern Hognoses are well known for their elaborate anti-predator behavior, which involves vomiting, defecating, and flipping over onto their backs. Research in the southern part of the Granite State has shown that prey likely limits their distribution in the northeast, as they are found on barrier islands with small amphibians but not those without. 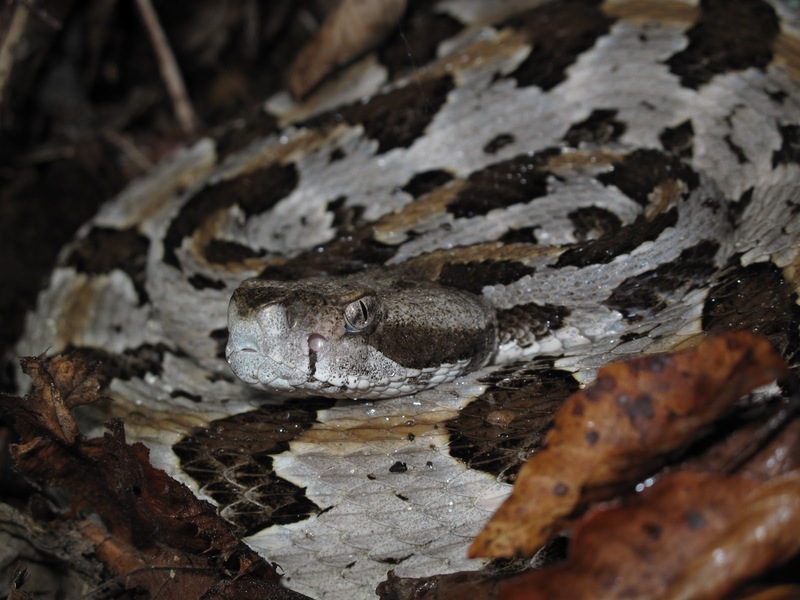 A recent radio-telemetry study at the New Boston Air Force Station revealed much about the habitat preferences of these snakes. Overall optimal habitat was identified as hemlock forests having continuous canopy and understory architecture interspersed with fine-scale openings, in close proximity to wetlands and with a high density of leaf litter, debris, and rocks as well as homogeneous surface temperatures within critical thermal limits. 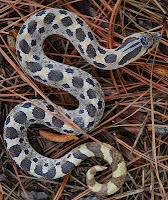 Eastern Hognoses mostly eat amphibians and occur in two color phases, dark and patterned. 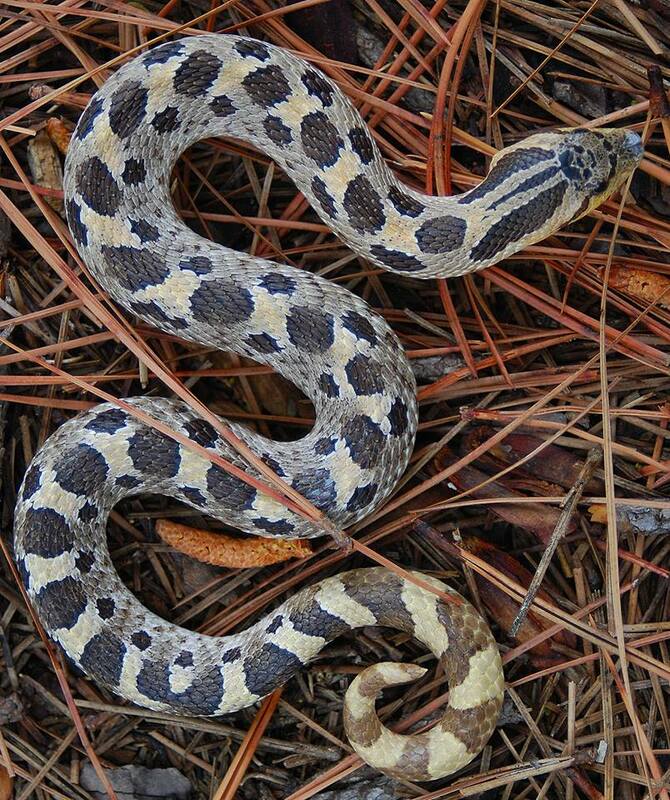 Much of the pioneering research on pinesnake biology has taken place in the New Jersey Pine Barrens. We know a lot about the surprisingly social lives of these large snakes - for instance, they communally bury their eggs in habitual spots used year after year by the same females. Pinesnakes prefer sandy, well-drained soils such as those in the the New Jersey Pinelands, which may provide residence for some of the largest populations of pinesnakes in the Northeast. Their reputation as ornery is mostly undeserved, much like that of their fellow Garden State residents (something I can admit despite having been born in neighboring New York). Having just been to New Mexico, I know first-hand that there are a lot of snakes there to choose from. In the interest of representing the widest range of phylogenetic diversity, I decided that the New Mexico Blindsnake should represent the state, in part because I was fortunate enough to find one while I was there (my first wild scolecophidian!) and in part because they can be found in only a few states in the US. 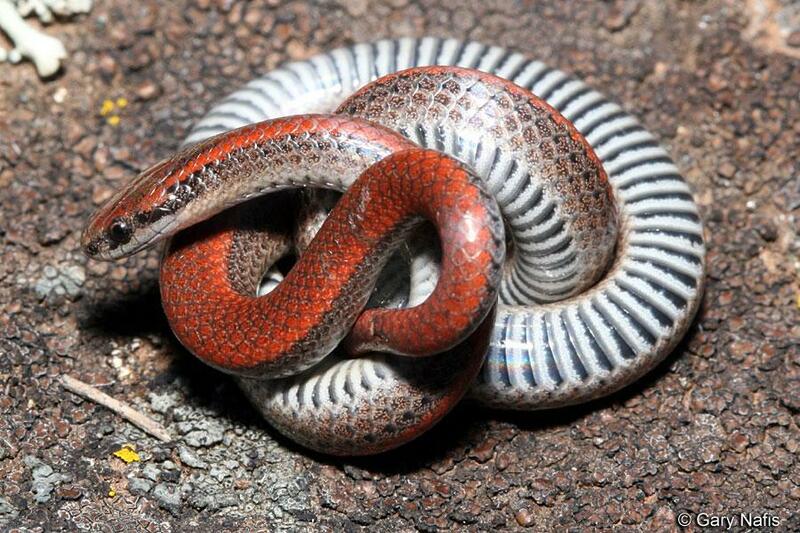 These diminutive serpents eat ants and termites and burrow in loose soil. This species was discovered by E. D. Cope in 1896 along a road to a silver mine at Lake Valley, New Mexico. 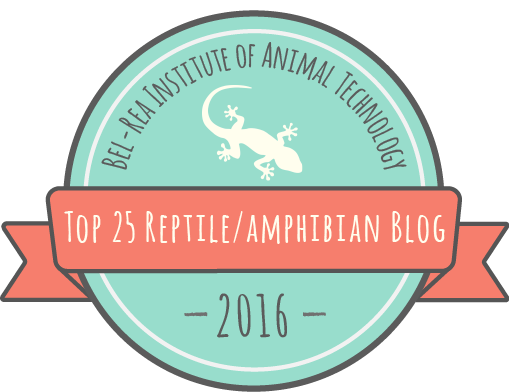 Runners up: Narrow-headed Gartersnake (Thamnophis rufipunctatus), Mexican Gartersnake (Thamnophis eques), Chihuahuan Nightsnake (Hypsiglena jani), New Mexico Ridge-nosed Rattlesnake (Crotalus willardi obscurus). You might think the Empire State would be better typified by a grander snake, but there are several good reasons that Brownsnakes are special to New Yorkers (or should be). The first specimen of a Brownsnake was collected in New York by Dr. James DeKay, a zoologist and author of the 1842-1844 book Zoology of New York. He found the snake while it was ""swimming across a large bay on the Northern coast of Long Island." John Holbrook, the father of North American herpetology, named the snake for DeKay, making it the only North American snake whose name is a double patronym (the genus Storeria being in honor of David Storer, a Massachusetts herpetologist; see Massachusetts). 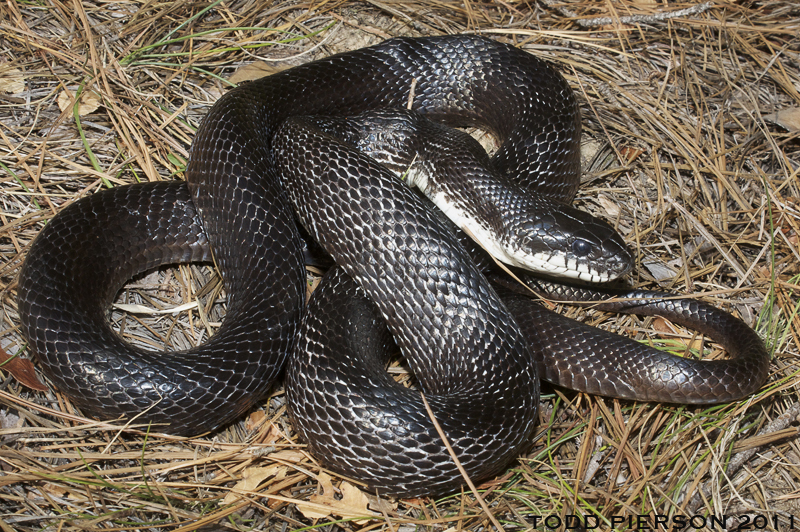 Southern Hog-nosed Snakes aren't doing too well throughout most of their range. Habitat destruction and degradation, fire ants, and mortality on roads are among their major threats. The Sandhills of North Carolina are their stronghold, and we'd like to keep it that way. The North Carolina Herp Society supports Project Simus, a non-profit research program with the goal of monitoring Southern Hognoses in NC and learning more about their biology through radio telemetry and other techniques. North Carolina recently named a State Frog, a State Salamander, and a State Marsupial, so a State Snake could be next! Runners up: Carolina Pygmy Rattlesnake (the beautiful red phase) or Outer Banks Kingsnake or Carolina Watersnake (both endemic subspecies found in the barrier islands). Racers are one of North America's most widespread snakes, found in every state except Alaska and Hawaii. They are highly variable in color, ranging from brown to black to green to blue. In North Dakota, they are greenish-blue to gray with a bright yellow belly and a white chin patch. They aren't called Racers for nothing: their speed is astounding and it is common to see these snakes for just a second or two as you walk through a grassland. Racers inhabit the sagebrush prairies of western North Dakota and are commonly found near sources of water. They have large eyes which aid them in their pursuit of their prey during the day. Young racers have a distinctive speckled pattern that slowly fades as they mature. Due to their widespread nature, this species might be a good candidate for a national snake as well. These small and interesting snakes were originally slated for Indiana, until I learned that not only were many of the seminal studies of them carried out in the Buckeye State and that they are named for an Ohio politician, malacologist, and co-founder of the Cleveland Museum of Natural History, Jared Potter Kirtland. Kirtland's Snakes are found only in the midwest, where they inhabit crayfish burrows. Because of the intensive agriculture that dominates rural areas of Indiana and other midwestern states, some of the best known Kirtland's Snake populations are found in urban areas. 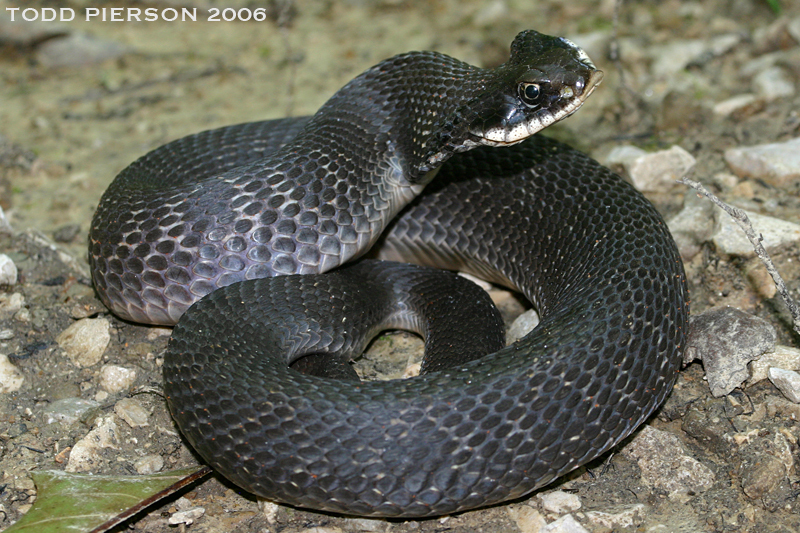 Runners up: Lake Erie Watersnake (an endemic subspecies), Black Racer (actual State Reptile). Much maligned symbol of the west, Western Diamondbacks are in much better shape than their slightly larger eastern cousins, in spite of heavy collection in some areas for use in rattlesnake roundups (festivals with the express purpose of executing as many rattlesnakes as possible in the misguided belief that this somehow makes people in the surrounding area safer). 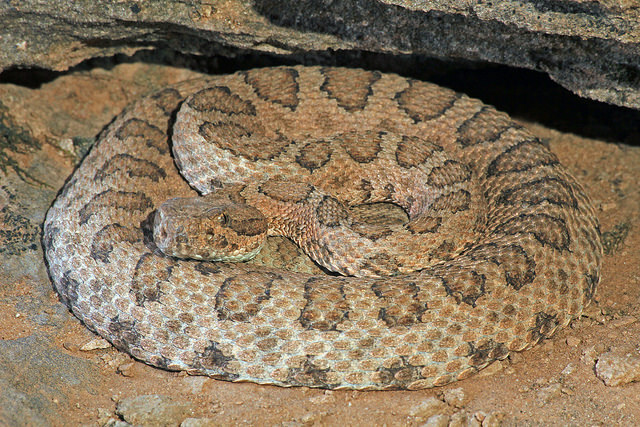 Corporate sponsorship and economic contributions to local economies have helped these festivals persist in the Sooner State and others, much to the detriment of wild rattlesnake populations. In fact, Western Diamondbacks and other rattlesnakes are not nearly as dangerous as cars, cigarettes, dogs, or many other things that people willingly accept as part of their lives. Granted, if one bites you you'd best get to the emergency room sooner than later, but they hardly deserve their vicious reputation, and confer many benefits to those with whom they share the landscape, including pest control. Although these snakes can be found in every state except Arizona, Hawaii, and Alaska, I have never seen more beautiful Common Gartersnakes than those in Oregon. Add that to the incredible coevolutionary relationship between these snakes and their toxic newt prey discovered in Oregon, and you have a good recipe for a state snake. 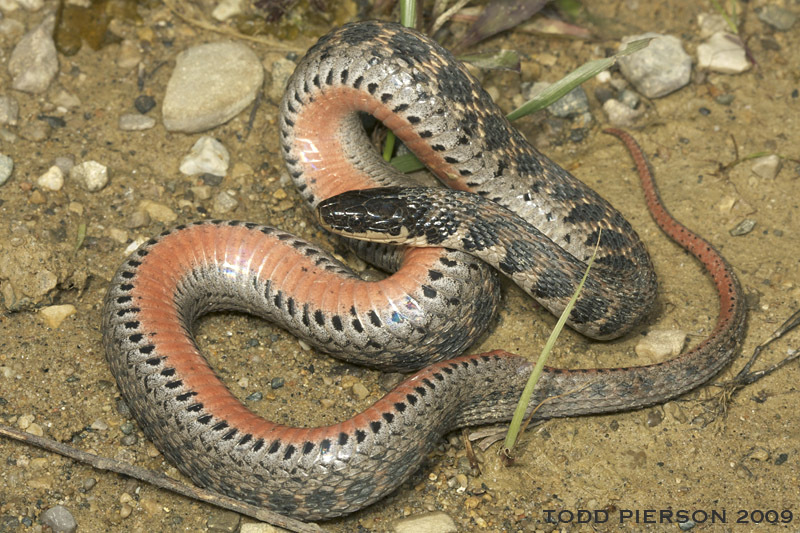 Common Gartersnakes are capable of resisting the neurotoxic effects of tetrodotoxin, which paralyzes the muscles and nerves of most other predators. 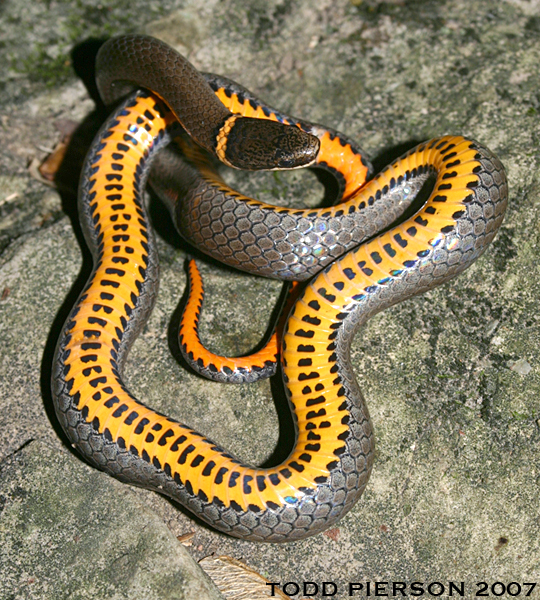 More resistant gartersnakes live in areas where newts are more toxic, are more brightly colored, and crawl more slowly. It's tempting to put this smallest eastern snake for Rhode Island, but because it was discovered in the Keystone State by the famous Philadelphian and entomologist Thomas Say in 1824, I think it's more apt for Pennsylvania. Say described its opalescent scales and called it "a very pretty and perfectly harmless serpent," noting that "it is found beneath stones and prostrate logs, but not very frequently." Wormsnakes eat invertebrates and so are beneficial to have in and around your garden. 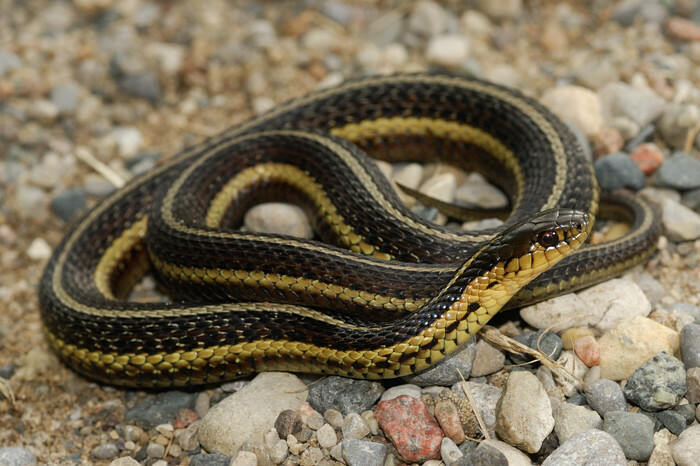 Runner-up: Narrow-headed Gartersnake (Thamnophis brachystoma), found almost exclusively in Pennsylvania. 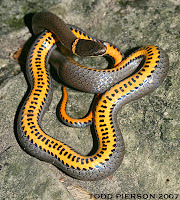 At least in the east, these snakes are small, with gorgeous yellow color beneath marked with black spots. Farther west, they are orange or red instead. 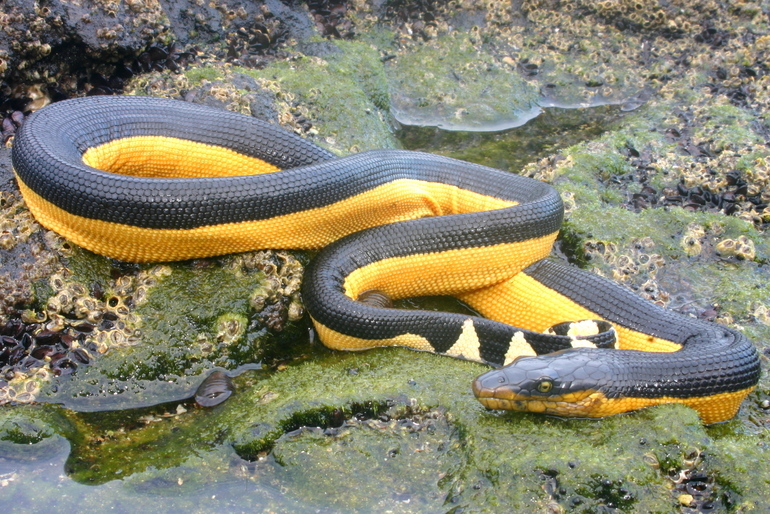 The yellow ring around the neck gives the species its name. Described by Linnaeus in the 11th edition of his Systema Naturae, it was one of the first species of North American snakes known to European biologists. Ringnecks are usually found close to water underneath rocks and logs, although they rarely swim. Rhode Islands's many historic stone walls are ideal habitat for this species. Eating salamanders and invertebrates, these snakes are harmless and beneficial. Don't miss the playoff game between the Rhode Island Ringnecks and the Nevada Nightsnakes! The Cornsnakes of the famous Okeetee Club of southern SC are famed for their bright colors. Popular pets, these snakes have been bred in captivity to produce a variety of color morphs not found in the wild. Cornsnakes eat lizards and small mammals and are named for their highly contrasting ventral pattern, which resembles an ear of Indian corn. Carl Kauffeld first wrote of the Okeetee Club in his book Snakes and Snake Hunting, wherein he recounts several of his experiences trying to find cornsnakes in their natural habitats. These rattlesnakes are fairly common in the Great Plains of the central USA wherever rocky outcrops (including man-made ones such as railroad track beds) provide suitable hibernation sites. 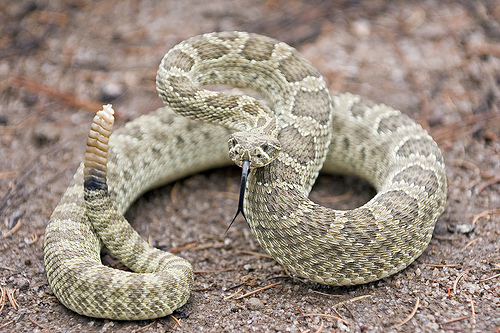 They are closely related to Western Rattlesnakes (see Wyoming), with which they shared a common ancestor about 9 million years ago. Following their rise, the rain shadow of the Rocky Mountains fell over central North America, causing a drying of the climate that led to the gradual replacement of open woodlands by prairie. Differentiation of the eastern form involved isolation plus adaptation to the expanding grasslands east of the Rocky Mountains. Today Prairie Rattlesnakes are common across the western two-thirds of South Dakota, where they prey heavily on rodents. 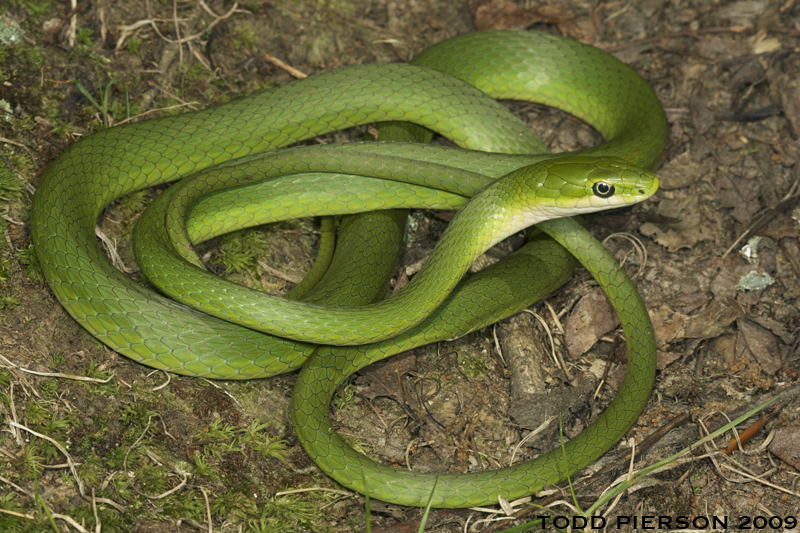 Rough Greensnakes are beautiful denizens of riparian woods throughout the Volunteer State. They were first recorded from "Carolina", which included Tennessee at the time. Also known as vine snakes, these arboreal, camouflaged snakes eat insects and spiders. Because they are so well-camouflaged, the best way to spot them is often at night using a flashlight. Difficult to keep in captivity, I would volunteer to study these any time, as they are among the most graceful and popular of snakes. 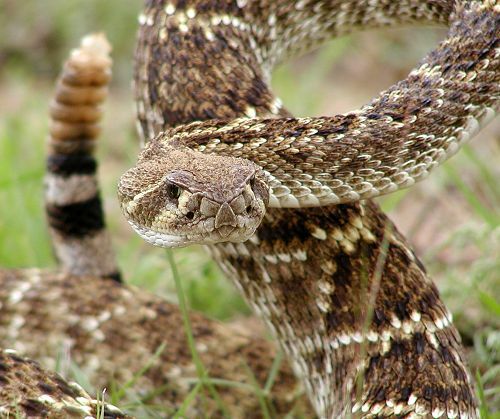 Texas has 85 species of snakes, more than any other state. I thought that Texans would like to have the longest or largest snake for their state snake (they'd probably call it their national snake), but both, as well as the largest rattlesnake, are more iconic of other places. 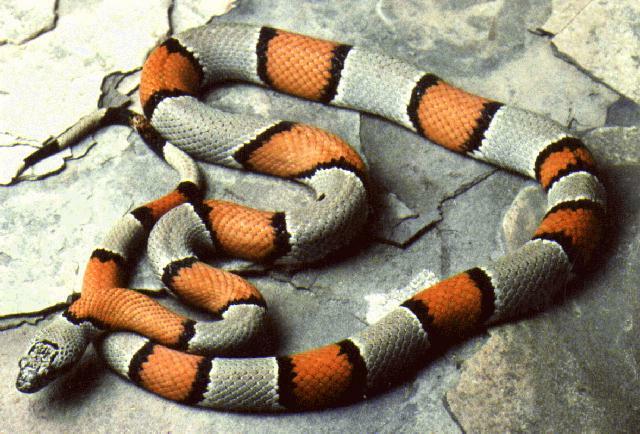 As such, they will have to do with one of the most beautiful and coveted, the Gray-banded Kingsnake. These secretive snakes are found only in dry, rocky areas of the Trans-Pecos and Chihuahuan regions of the state, where they are active at night. Although popular in the pet trade, very little is known about the ecology of these snakes in the wild. 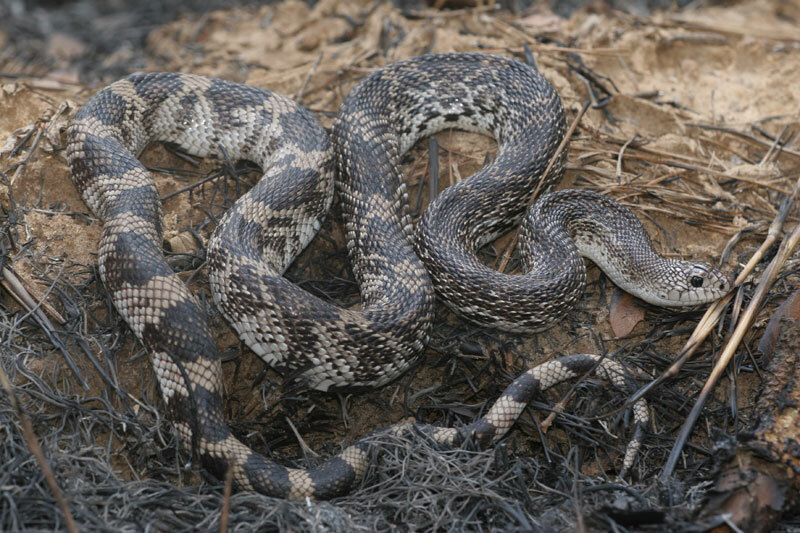 Much of their habitat is inaccessible, made more so by strict laws regulating the recreational pursuit of snakes (herping or snake-hunting) in the state of Texas. Runners-up: Speckled Racer (Drymobius margaritiferus), Concho Watersnake (Nerodia paucimaculata), Brazos Watersnake (Nerodia harteri), Texas Indigo Snake (Drymarchon corais). Because I currently live in Utah, I can attest to the ubiquity of these snakes almost throughout the state. So named because of their propensity to stray far from water, Wandering Gartersnakes have something in common with the early Mormon settlers of the Beehive State, who emigrated from their original homeland in New York through the Midwest to eventually end up in what is today Utah. Wandering Gartersnakes eat fish, frogs, and small mammals, and lack the resistance of some of their congeners to newt toxin because they do not co-occur with newts over much of their range. Familiar to many in the eastern US, ratsnakes are on the ropes in Vermont. 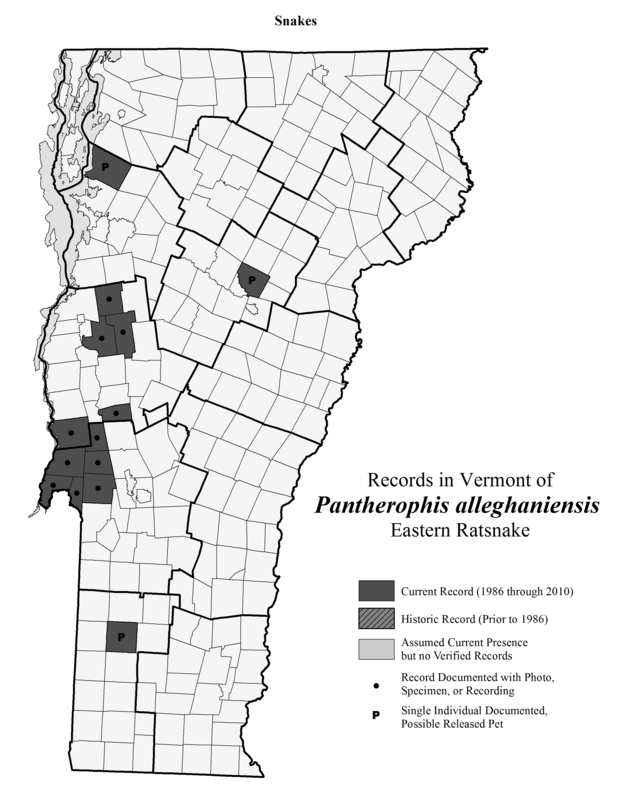 Records from the west-central part of the state date from recent decades, with possible isolated populations in other areas of the Green Mountain State (though these records could represent releases of captive animals). Ratsnakes have been designated a Species of Greatest Conservation Need in Vermont’s Wildlife Action Plan. Popular in captivity, we are just beginning to learn about the ecology of wild ratsnakes, which are highly accomplished climbers and important nest predators. Their communal nesting ecology at high latitudes and their intriguing foraging and social behaviors are likely just the tip of the iceberg. 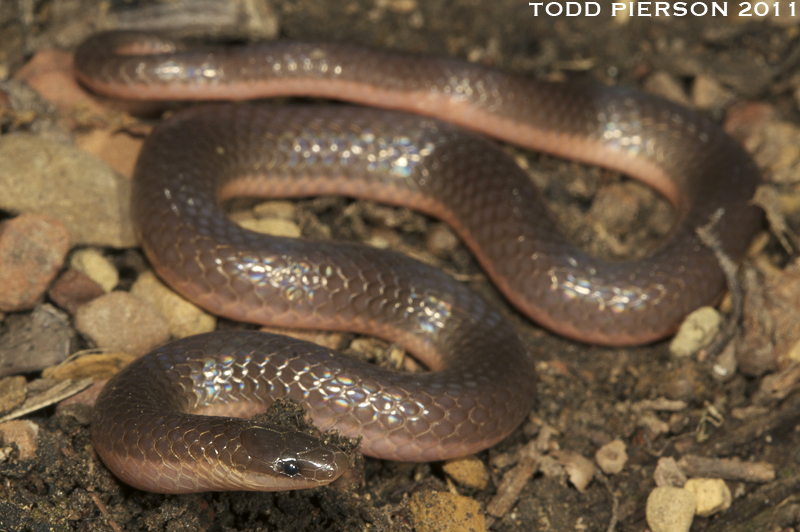 These small brown snakes come in two types, rough and smooth. 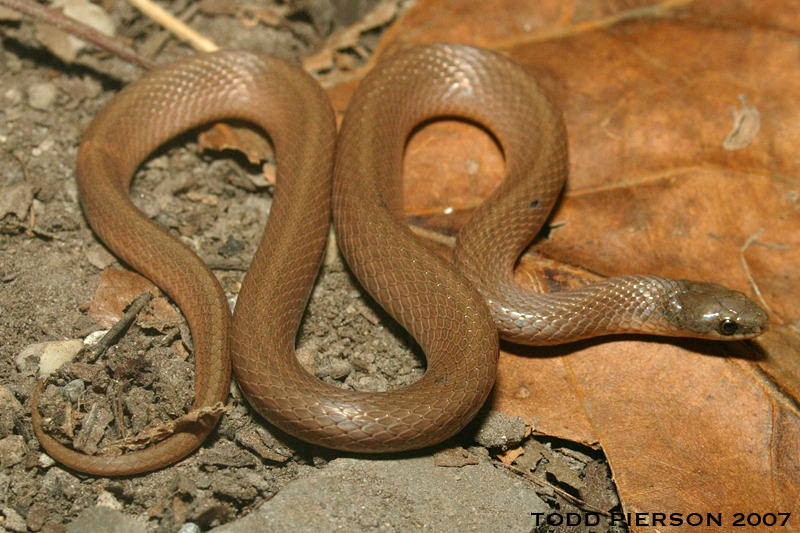 The Rough Earthsnake (Virginia striatula) is found in the southeastern part of the state, whereas the more widespread Smooth Earthsnake (Virginia valeriae) is found across the eastern two-thirds, and also in isolated populations in the western tip. Virginia also shares with adjacent states an unusual population of Smooth Earthsnakes, called Mountain Earthsnakes (V. v. pulchra or, sometimes, simply V. pulchra), found in high-altitude glades in Highland County, Virginia, and adjacent WV, MD, and PA. Mountain Earthsnakes have scale characteristics intermediate between the other two, although they are more closely related to Smooth Earthsnakes. 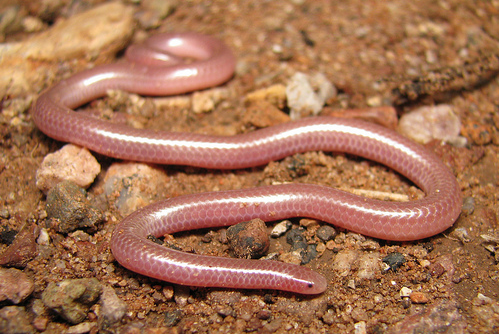 Sharp-tailed Snakes are small and locally common. They are named for the needle-like spine on the end of their tail, which nevertheless is not actually very sharp and with which they certainly cannot harm a human. This is a good snake to have around your garden, as they eat slugs and other invertebrates harmful to plants. Sharp-tails are mostly found in Oregon and California, but an isolated population occurs in central Washington, where dozens of individuals can sometimes be found together underneath cover objects. Sharp-tailed Snakes may turn out to be more widespread in Washington, especially since they were first discovered in 1852 by members of the U.S. Exploring Expedition near Puget Sound, a region from which no further specimens have been found. Perhaps state snakehood would promote further exploration. Kudos to West Virginia for choosing a snake for their state reptile in real life! As a reward, they get to keep it. The Timber Rattlesnake isn't an inapt choice, as they are found in mountainous forests almost throughout the state, wherever suitable overwintering habitat exists. A recent analysis of the diet of Timber Rattlesnakes in the northeastern US suggested that they may help regulate tick populations through consumption of their mouse hosts, thereby probably reducing the risk of human exposure to Lyme disease and other tick-borne pathogens. Runner up: the other (Rough) Earthsnake (Virginia striatula). 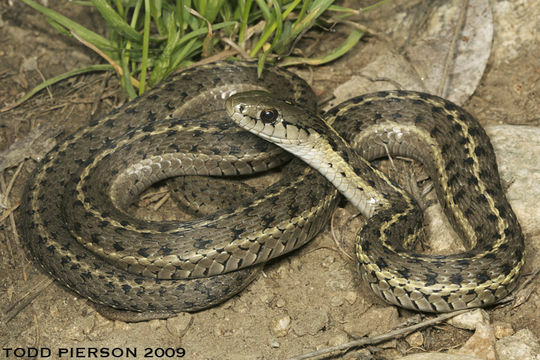 Butler's Gartersnakes are found in open-canopy wetlands in the southern Great Lakes region. In reality, enough Wisconsinites dislike Butler's Gartersnakes for getting in the way of development in the Milwaukee area that it's got about as much of a chance of getting chosen as the state snake as the Spotted Owl has of becoming the state bird of Oregon. However, efforts to manage and preserve the remaining habitat might just succeed, and could be significantly helped along by placing a little more value on these little snakes. In the land of visionary land manager Aldo Leopold, I agree with this One Wisconsin Now blogger that good stewardship should trump special interests when it comes to Butler's Gartersnakes. These relatively small rattlesnakes are fairly common in the arid west anywhere that rocky outcrops provide suitable hibernation sites. They are closely related to Prairie Rattlesnakes (see South Dakota). These two species shared a common ancestor about 9 million years ago, populations of which were separated by the rise of the Colorado Plateau during the Miocene epoch. Volcanic activity in the southern area of the plateau prevented contact between the two populations. Further differentiation of the western form into six subspecies involved adaptation to various cooler climates west of the Rocky Mountains. The subspecies that occurs in the Cowboy State today is the Faded Midget Rattlesnake, a diminutive snake with a somewhat subdued pattern. Feel free to chime in with your opinion about what your state's snake should be, if it differs from mine. What do you think the National Snake would be, if the USA had one? Vote in the poll at the right, or share your opinion in the comments below. If you missed Part I, check it out! Thanks to Pierson Hill, Todd Pierson, JD Willson, Taylor Henry, Dan Johnson, James Turek, and Gary Nafis for use of their photographs.